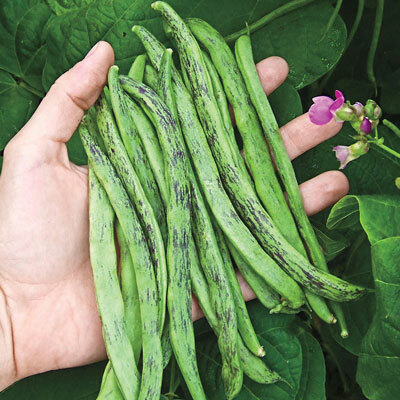 Rattlesnake Pole Bean | Henry Field's Seed & Nursery Co.
Sweet, rich flavor is a Southern favorite. Very productive in hot, humid areas of the southeast. Pick when pods are small to medium size to avoid development of "strings." A favorite across the South, Rattlesnake is a full-flavored bean with a sweet, rich taste. Green pods are streaked with purple (changes to green when cooked). Very tender and freezes without becoming "rubbery" like most bean varieties. Also good for canning and fresh use. 70 DAYS. Seed Counts: A 2-oz. packet of snap bean seeds (bush and pole) contains about 150 seeds and sows a 25-ft. row. A 2-oz. packet of snap bean seeds (bush and pole) contains about 150 seeds and sows a 15-ft. row.